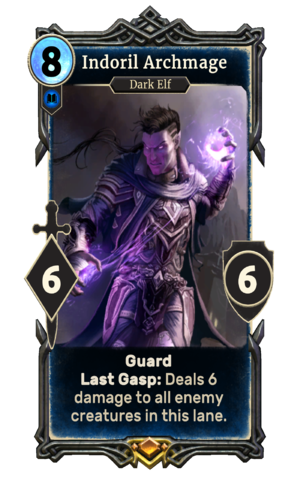 Indoril Archmage is a legendary Intelligence creature card. It is part of the Core Set. "They will die by the prince of plots!" "By the sacred words of Veloth!" "Meet your death, foolish s'wit!" "I will give you pain beyond measure!" The card is named for House Indoril, one of the Great Houses of Morrowind. The card's art was formerly used as the game's icon.